Last week I wrote a post about the new Snack Pack, where three local results have become the new standard, and explored where users were clicking based on some preliminary data from UsabilityHub tests we ran. 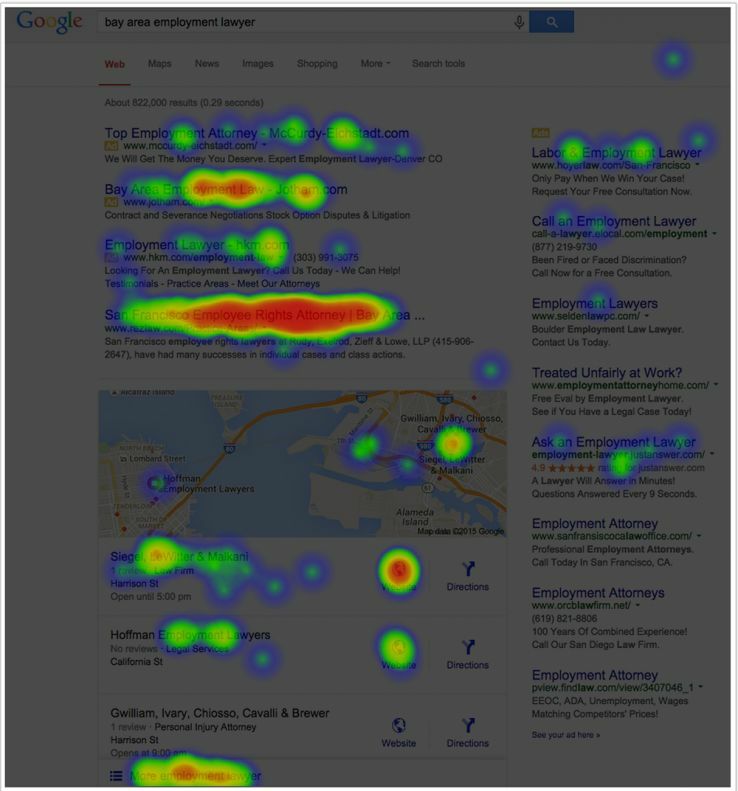 In our test, we measured 200 clicks on a heat map to see where users were clicking most. Since the release of this study, we’ve been conducting many more tests that take into consideration other variables, such as the different types of results that display and the impact of reviews. 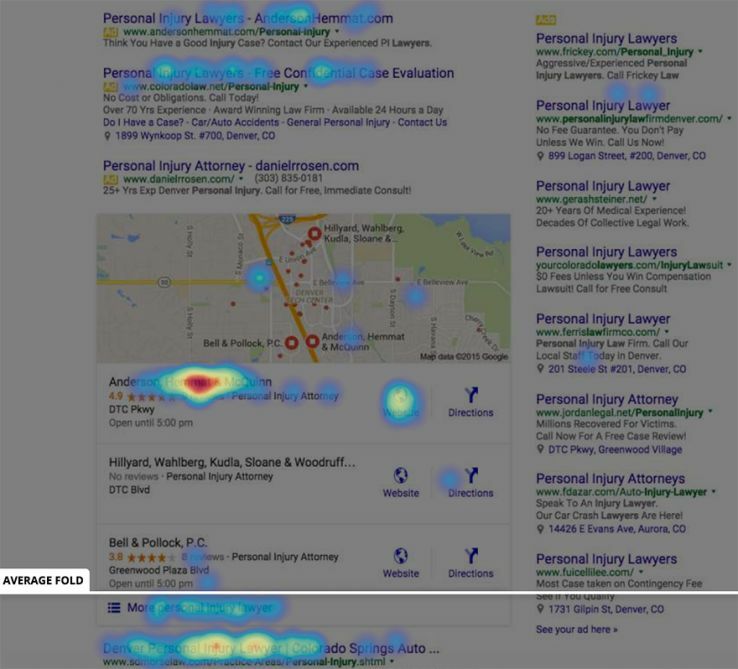 In this article, we’re going to analyze some new click-through studies, conduct live interviews with potential searchers, and talk about the new best practices you should focus on to win the local search game. If you’re not familiar with the major impact of this update, you can read this great post by Jennifer Slegg. Although this study will showcase some interesting results, take it as anecdotal evidence. Since there are so many search variables—ranging from the keywords used to personalized results, from the device used to display results to the text on the listings—we couldn’t be as scientific as we would have preferred. I am also not a data scientist. However, keep in mind that these are real users performing real tests, which makes for some interesting takeaways. In essence, this research is meant to be insightful, but not definitive. Our sample sizes may be small but the users are real, so I hope this inspires you to see which areas you can improve upon for your clients. Which Variants Did We Want to Analyze? In this example, you’ll see one organic listing underneath the pay-per-click ads, followed by the Local Snack Pack of three listings. 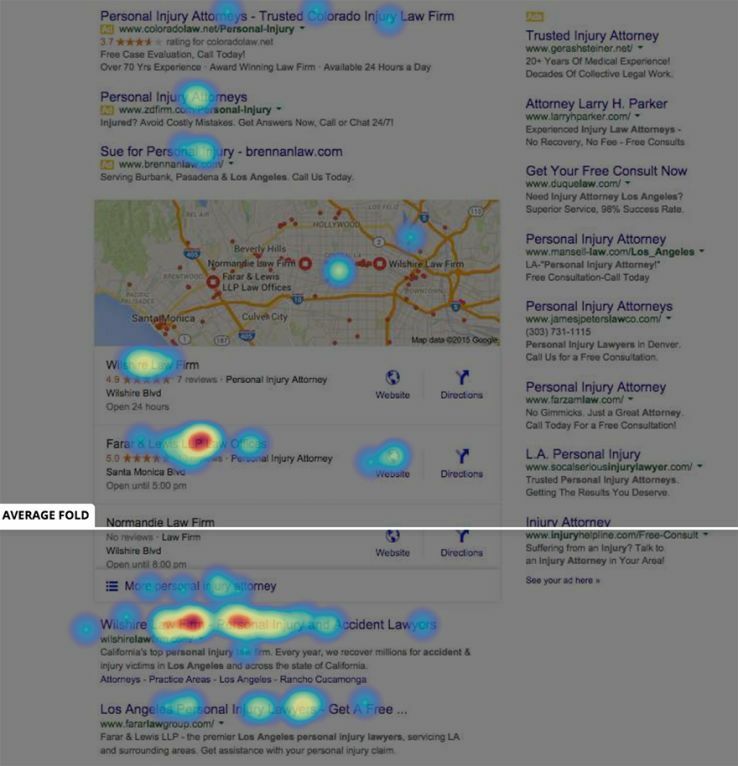 These heat maps were generated from a few custom tests we set up, using screen recording and heat map tracking via HotJar. We fed the traffic through Mechanical Turk and asked users where they would click if they had just conducted a certain search. Local results seem to be getting more clicks than expected on this round. Notice that there was a very clear distribution of clicks between the two listings that had review stars when compared with the listing that didn’t have any review stars. In a close second follows the organic listing. This means that many users skipped over the local listings entirely and opted for the traditional organic result. We can’t say exactly why this is, but it could be that users are not yet used to this format. We may see a shift in this behavior over time, as users become more accustomed to the change. This is the same test we conducted in our post last week, now using a different data collection method, as mentioned above. Although we haven’t seen these listings as much in the SERPs, it’s interesting to see the impact the single organic listing has on clicks. In this test, we asked the user where they would click if they were researching an employment lawyer. The heat map is shown below. The line in the heat map represents the average fold. Since we were able to run this same test with a different user base last week, we can compare and contrast some of the data. 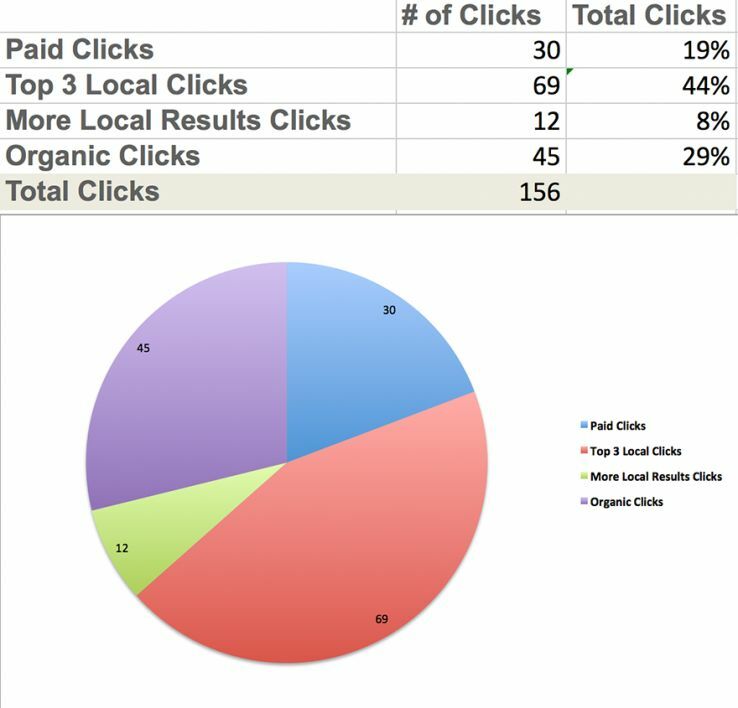 In the previous test, about 40% of clicks went to the organic listing, compared with 62% for the current test. 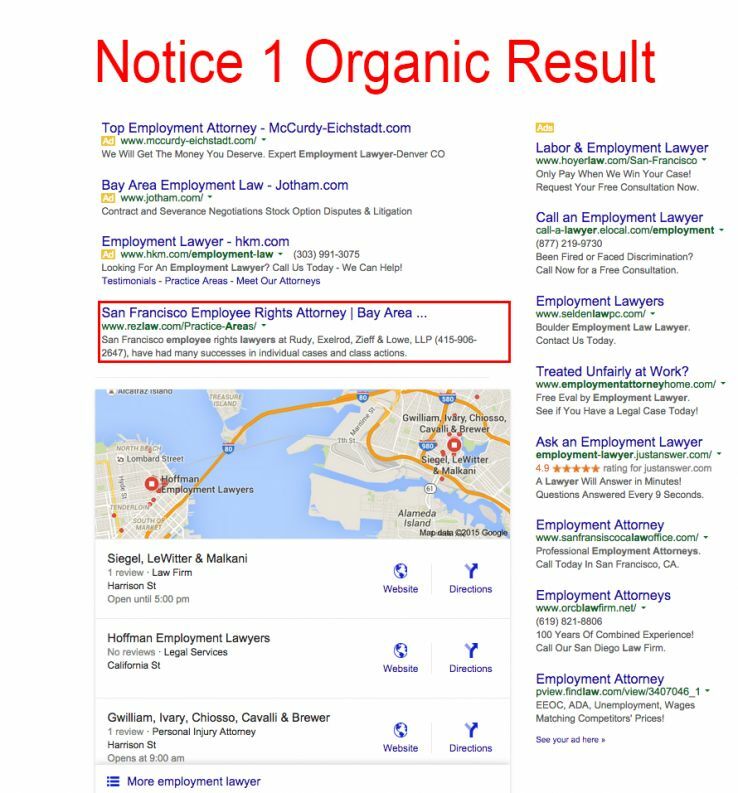 It seems pretty clear that the organic listing above the local results is the place to aim for, if available. 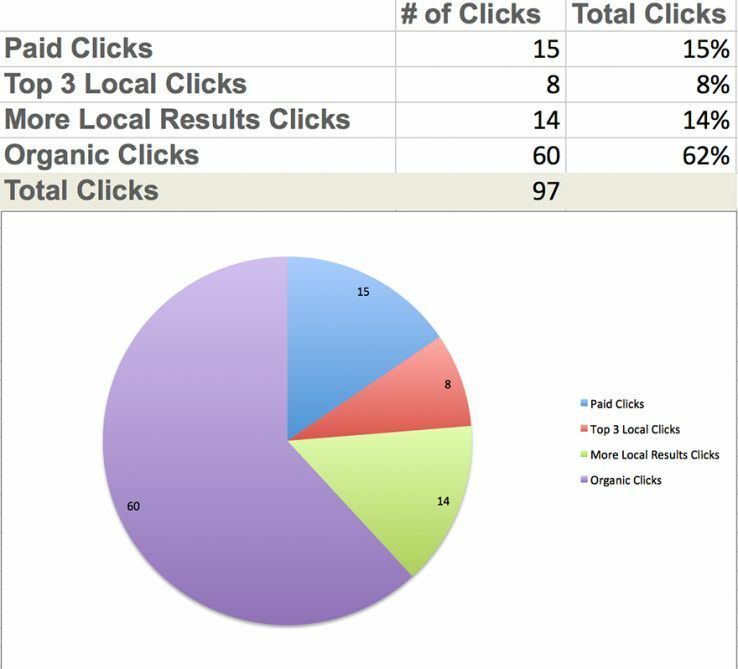 Notice how the local pack got very few clicks overall, resulting in just 8% of clicks (or 22%, if you include the “more local results” option). Does this seem weird? It does to me, but there is a key difference between the screenshot we used for this test and that which we used for the last one. There are no review stars present in the screenshot for our current test. It appears that the results with reviews were clicked more often than those without. Once again, there was a wide variance of where users clicked in this study. This time, the organic listings represented 40% of the clicks, taking home the gold. 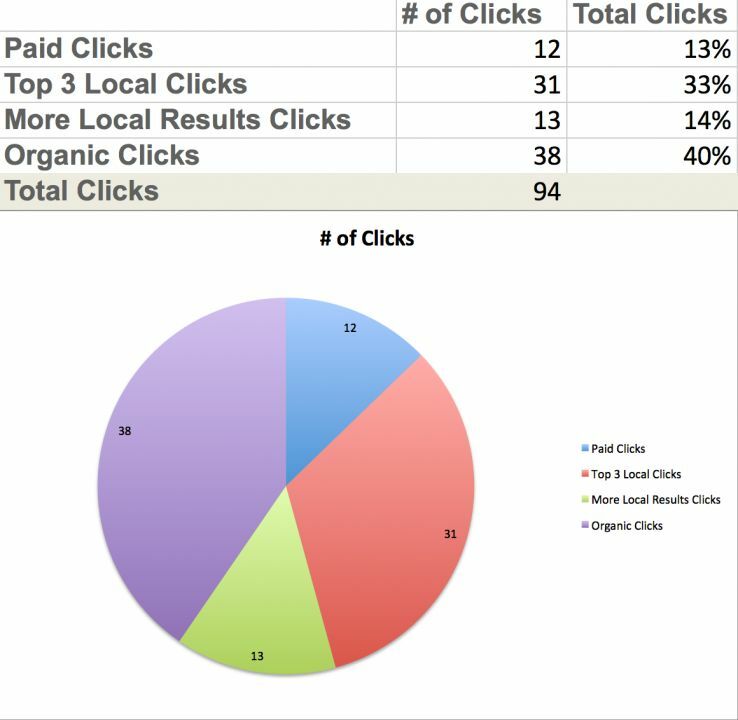 Local was in second place, with 33% of clicks. However, another item of interest is that the listings with reviews got the clicks. The third listing, with no review stars, received zero clicks in the local 3-pack. Additionally, it’s worth nothing that most of the local-centric clicks land on the business name itself. These clicks no longer lead straight to your website or even your old Google+ page, where you still controlled the information to some extent. These now take you to a map page, where other businesses are displayed and where users can read your reviews. Essentially, just because you got a click to your listing in the local 3-pack doesn’t mean you’ve earned a visit to your site or a phone call. Heat map data is super cool and fun to look at visually, but I wanted to dive a bit deeper and see if I could collect more accurate search data. Since we don’t have access to Google’s actual data, we have to simulate click-through studies based on a certain amount of variables and find the means to test our hypothesis. In the past, we’ve used Mechanical Turk and UsabilityHub for the majority of these tests. The potential problem therein is that we don’t get as much information on the users, and it doesn’t involve the emotions present with someone who is more invested in the search. To simulate this and explore whether the data correlated with real user behavior, my friends at Fox Airsoft allowed me to stop in for the day and interview their actual customers. To do this, I created a very specific scenario for each of the candidates and screen-captured their behavior with a short interview. Keep in mind that for this test we specifically explored desktop user behavior, as that format was affected by the new Snack Pack update. In this scenario, she used a laptop computer and performed the search from Google’s home page. 1) Local results ultimately earned the click. 2) Reviews were the reason the first local click won the battle. Would Leah’s behavior change if the organic results featured rich snippets with reviews and a five-star rating? When the search results page loaded, he recognized some offline branding from the show “Dog the Bounty Hunter” and mentioned he knew of Bobby Brown Bail Bonds because of this. However, even though he knew the brand, he put more weight into the reviews before deciding to click through to the first local result’s website. As you can hear in the interview, the reviews also played a big part in his decision here. 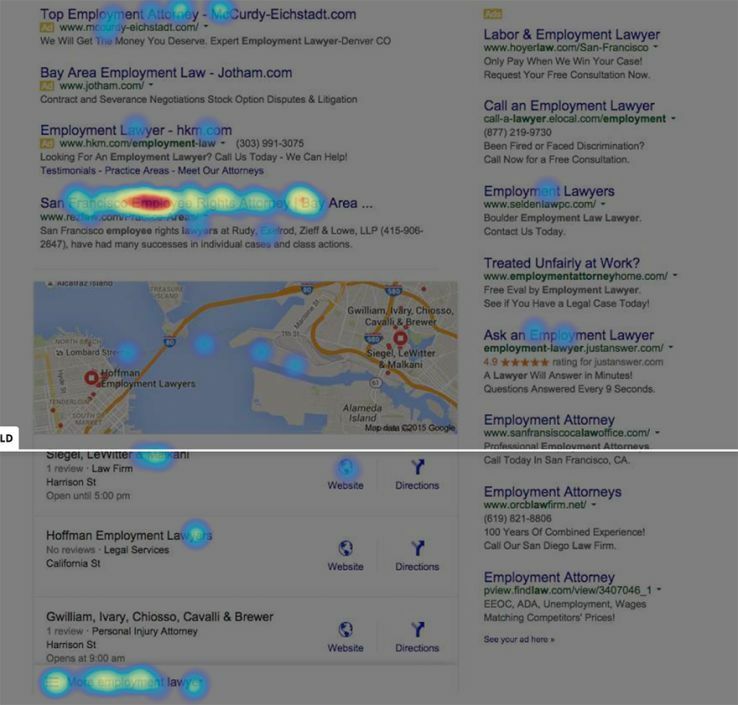 1) Todd was most interested in the top two local results, both of which include review stars. 2) The first-position listing won the click in the end, though. Kaitlin is a 25-year-old female who works in the airline industry full-time. Kaitlin was given the same scenario as the others. Kaitlin started at Google and used a geo modifier in front of the keyword she chose: “Denver Bail Bondsman,” selected by autocomplete. She looked at the results and scrolled past the top two local listings—likely because they did not have any review stars associated with them, unlike the third result in the Snack Pack. Kaitlin clicked on the listing’s business name, which brought up the new map-type view. Here she could read the reviews. Her behavior was different than our other samples because she said she would do multiple searches before making her final decision. Kaitlin seemed to have more interest in looking at the best and worst reviews before making a decision. She also used Yelp to explore reviews. 1) Local results earned the first click on the business listing that brought her to the map view. Keep in mind that other local businesses are also listed here. 2) Reviews were the reason the first local click won the battle. Positive and negative reviews made the difference. 3) A result with zero reviews in a pack where others include them seems to be a negative factor for click-throughs. Clayton started his search in Google with a geo modifier of “Denver CO” at the end of his search. The overall keyword phrase he chose was “best bail bondsman denver co.” He scrolled down long enough to look at the local results and the top two organic results. 1) Local results earned the first click on the business listing that brought him to the map view. 2) Not to beat a dead horse, but the decision was made because there were review stars present. With all of these tests, there was a ton of information to soak in. While it’s clear that each user’s behavior is unique, whether on a click-test study or an in-person interview, there are some very clear patterns that you can focus on. Even though we don’t have data from thousands or millions of users, these real-life examples shed light on what you should focus on with the new local 3-Pack. In every test we ran, reviews seemed to attract the most clicks. Not only did they attract a lot of clicks, it also seems clear that being listed in a pack where your competitors have review stars and you don’t is detrimental to your click-through rate. The importance of reviews seems to be as high as ever, and I would go so far as to say that if you don’t have review stars—and don’t plan on putting in processes to get legitimate reviews—you’re making a bad business decision. With organic and local tied together ever since the Pigeon update over a year ago, I’m hoping your SEOs have adopted an organic and local search strategy. If you still don’t have an organic search strategy, make sure to create one. 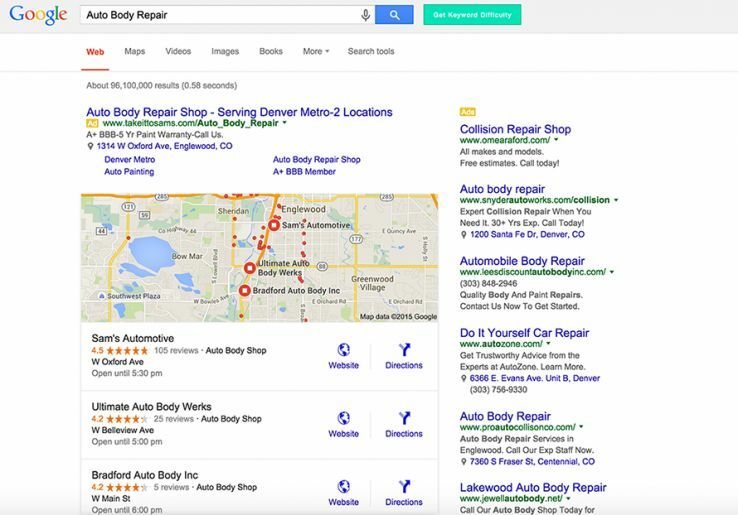 Ranking higher in organic results will only help your local results, and you even have the potential to take up two listings in the search results for your business. DO NOT IGNORE ORGANIC. Bring your website up to snuff using SEO best practices and continue to earn high-quality links from reputable sources. Consider adding rich snippets of reviews to your organic pages if they meet Google’s guidelines. Even if you’re not listed in the top three results, some clicks are going to the maps results and the “more results” options. Being listed in the top 6 or 7 positions will still have you listed above the fold on the left side of the map view. Don’t ignore it. Take advantage of it. What if your competition doesn’t have any reviews? Maybe being #6 on that list can make a huge impact on your business simply by being the only one with active review stars. Do your keyword research for your niche and don’t ignore geo modifiers. I’ve written about this in the past, but individual search behavior varies greatly. In a few of the videos above, we saw variants on these modifiers, such as “Denver Bailbondsman” to “Bail Bondsman in Colorado Springs, CO.” Make sure you’re looking at proper keyword volumes for your variants and optimize if necessary. One process that I have come to adopt and love is doing our own testing. Your results may produce different information, based on your niche or search behavior. Conduct your own tests, see what works, and report it to the world. We all benefit from this, and can make some great Internet marketing decisions as a result. With so many different variables out there to test and ways to launch bigger studies, we’re interested to hear what you think. What type of tests would you like to see?